A modern, 2 bedroom, single-storey, house of approximately 1,000 sq. ft. (including the verandah). The house has two bedrooms. The master bedroom has an en suite bathroom with a tub/shower and there is a full guest bathroom. The large (10’ x 30’) verandah is screened and also has screenIng under the deck, to prevent the ingress of insects and bugs. Ideal for relaxing or entertaining. The house is well-decorated with a nice wooden floor and the kitchen has many cupboards and an island. Counter tops are granite. There is a/c in the living room and ceiling fans in every room. it has hot water, internet and cable tv. The house is raised from the ground and has a storage space under the house. It sits on a large, approximately 85’ x 100’ lot which is nicely landscaped and has a picket fence and many coconut palms. The property has electricity and piped water and also has a rainwater cistern as back up. There is a large carport. The house comes fully furnished and is ready to move in. The buyer of the house also has the option to purchase the adjoining large, 80’x 100’ lot, at below asking price. 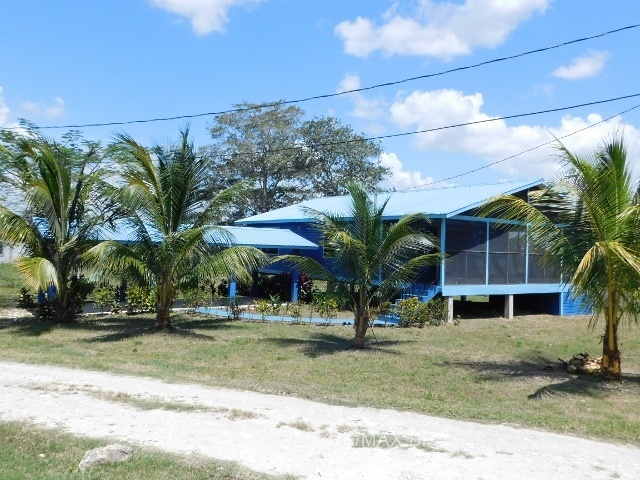 The property is located on a residential estate just off a main road on the outskirts of San Ignacio. It is close to the hospital and about 1 mile to the town centre. Contact us at john@belizepropertycenter.com for additional photos.